While the dazzling Alpine kingdom of Zurich may be well-known for its prosperous banking industry, it has also emerged as a tourist-friendly city with plenty to offer. 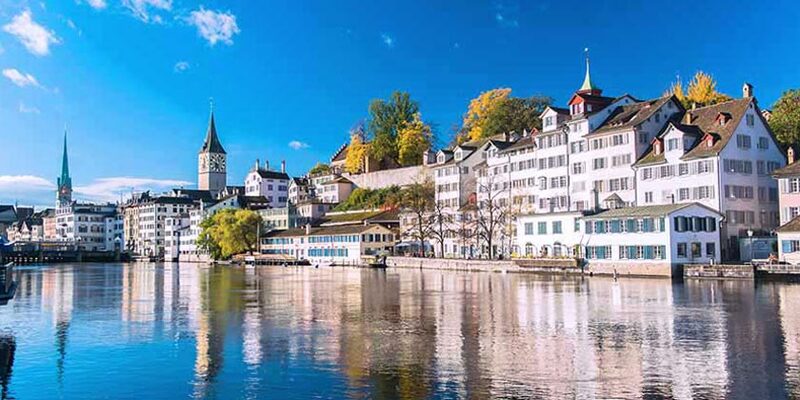 Set on both Lake Zurich and the Limmat River, the natural backdrop alone makes Zurich worthwhile to visit in addition to offering a variety of other sites, such as the medieval Fraumünster church, Sprüngli chocolate factory, and Kyburg Castle. Zurich also provides an ideal place to start for day trips to Switzerland’s other notable cities, including the medieval Bern, charming Lucerne, and the culture-rich city of Basel. Your Zurich vacation will leave you wanting more and more adventure. Enjoy a comprehensive afternoon coach tour of Zurich and see the top attractions the city has to offer. Sit back and enjoy a scenic coach ride over the Albis Pass and along the shores of Lake Lucerne. Sure to be a highlight of your Switzerland vacation, this day trip from Zurich takes you into the Swiss Alps. Bring your sweet tooth and get ready for a tantalizing array of delicious treats on this decadent walking tour of Zurich. Resort info: A sleek boutique hotel offering modern accommodation and includes a fine restaurant and an excellent location close to the Altstadt and Lake Zurich. Resort info: A historic 5-star hotel offering elegant accommodations with an award-winning restaurant and an excellent location on the edge of Lake Zurich. Resort info: Steps from the Opera House, beautiful lake Zurich, the Bahnhofstrasse shopping district, and the citys business center, Sheraton Zurich Neues Schloss Hotel, is a quiet spot in the heart of the city. Resort info: Centrally located, Four Points by Sheraton Sihlcity is surrounded by restaurants, shopping, business offices, a cinema, and even a discotheque. Resort info: Ideally located in the green just a few minutes from the old town, the lake and the Bahnhofstrasse in a preferred residential area in the town centre. Resort info: Various choices for shopping, many restaurant and bars, museums, cinemas and theatre as well as the Lake promenade and main station is in walking distance. Resort info: The century-old City Palais located in the very heart of Lucerne has been masterfully restored.